While touring a middle school in Dallas, DeVos was asked about the Oklahoma teacher walkout. 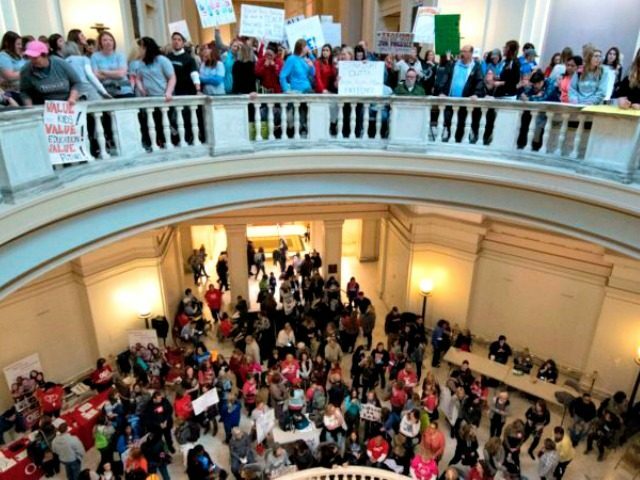 Teachers from dozens of Oklahoma school districts are in the second week of a strike as they packed the state Capitol Monday demanding the Republican-led Senate approve new tax hikes to fund increases in education spending and teacher pay. Public schools were closed Monday. Teachers in Oklahoma have been among the lowest paid in the country and are demanding a $10,000 raise over three years. They claim the state education budget has been victimized by tax breaks provided to Oklahoma’s energy industry. Parent activist Jenni White of Reclaim Oklahoma Parent Empowerment, wrote many parents are distressed by the “loud and obnoxious” behavior of some of the striking teachers. In a scene reminiscent of the Wisconsin teacher rallies in their capitol building, apparently a full gallery of teachers in the House, created a stir when a bill not on the Floor Calendar was attempted during session on Tuesday. According to the report, the disturbance was so loud and disrespectful, the gallery was cleared. This is fascinating in part because, when we lobbied against Common Core, we were told we would have to get rid of yellow, 8 ½ x 11 sheets of paper simply saying, “Hear The Bills”, or leave the building, yet pictures have been splashed all over the news media of teachers with poster board signs in the rotunda. Of course, anyone with a green Common Core Is Not OK t-shirt was chastised for even whispering in the gallery during session, but I guess we’ve devolved since 2014. To pay for increased education spending and pay raises, Oklahoma striking teachers want Republicans to scrap a bill that would remove a tax exemption on capital gains, reports Reuters. Additionally, union leaders are demanding a hotel tax to raise approximately $50 million. Republican lawmakers have responded by approving nearly $450 million in new taxes and revenue, but teachers are demanding $600 million.